Let's Do It for ME! : Let's Scare to Care at Halloween! Photo Competition, Scary Bear Party and more ..
Let's Scare to Care at Halloween! Photo Competition, Scary Bear Party and more ..
Let's be devils and help Invest in ME reach their fundraising ghouls this Halloween! as well as great donations for our favourite charity - Invest in ME! Giveacar are looking for creative, imaginative photographs of your Halloween festivities - pumpkin carvings, spooky costumes, terrifying decorations or maybe something even more unique! The competition will run from Friday 24th October to Tuesday 4th November at midnight. Facebook: Go to the Giveacar Facebook page, like the page and upload your photograph to the timeline. Make sure you mention Invest in ME charity in the text! (your picture won't appear on the timeline straight away but Giveacar will have received it). Twitter: Tweet your photograph, making sure that you include @Giveacar so that they can see it and mention the name of Invest in ME charity (@Invest_in_ME) Follow @Giveacar to be notified of the results. Email: You can also email your entries to charity@giveacar.co.uk making sure that you attach the photograph and mention Invest in ME charity. Giveacar will release the results on Friday 7th November - GOOD LUCK! More fiendish ways to raise funds or have just have fun and lift some spirits ..
Well enough for a Halloween party, or know someone who is? Why not ask them to scare to care and donate £5 to Invest in ME? Not well enough to party, but want to raise some spirits? 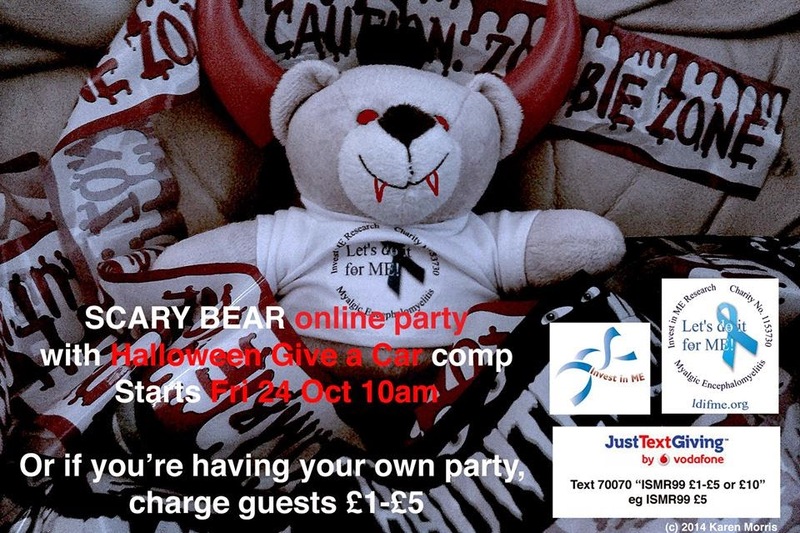 You are warmly invited to join Scary Bear for M.E. Halloween online on Facebook! See you there, if you dare .... mwahahah! 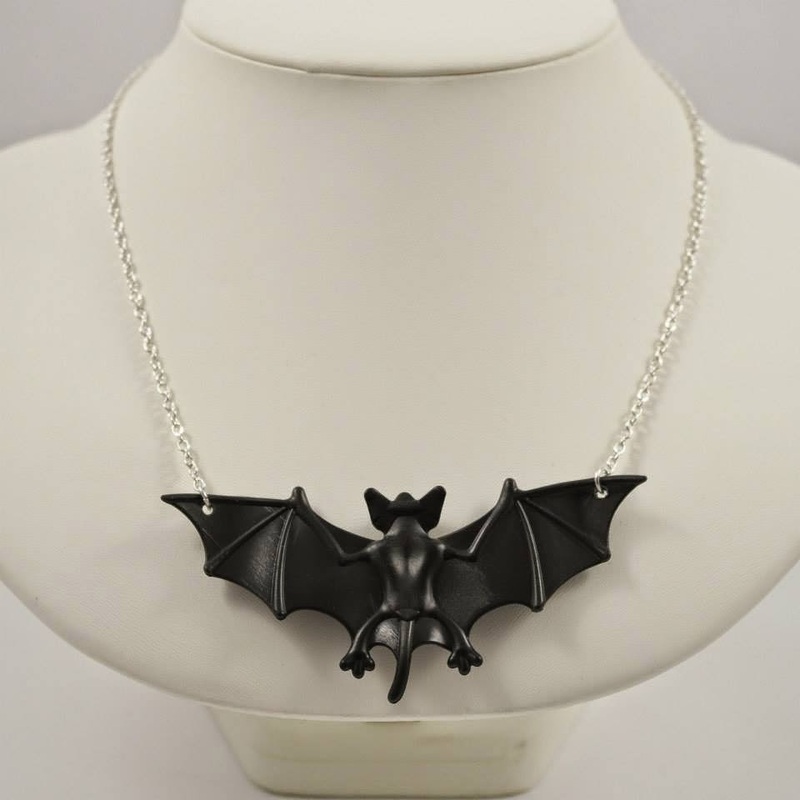 Need some fiendishly fine jewellery to adorn your party scary wear? 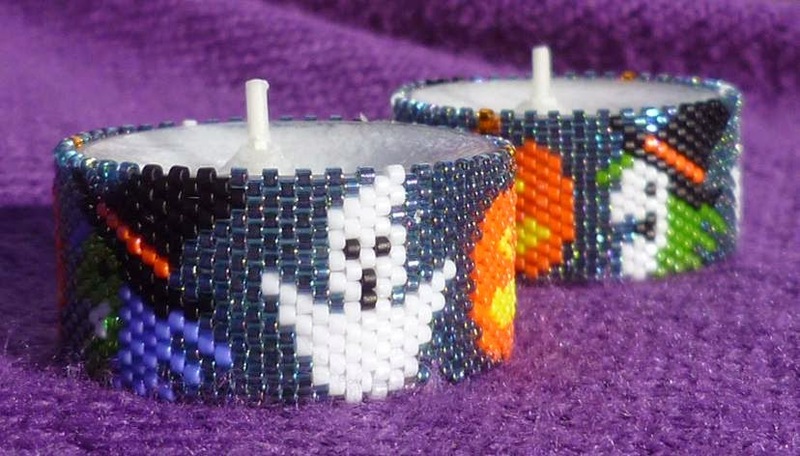 Fly on over to Jenny's Treasures Halloween 2014 Album! Want to shed a little light on the night? Alison Orr's gorgeous candles - organic unscented option available! Roger's Fright Hike for Invest In ME! Batastic! Roger Ogborne's story: "On 31st October I will be taking part in the Fright Hike; A 20 mile hike through Epping Forest in Essex in the dark! I will be starting at Midnight on Halloween and I am doing it to raise money for Invest in ME as my daughter was diagnosed at 15 with this illness. Invest in ME is a charity that seeks to raise money to fund biomedical research in regards to ME." See Roger's Everyclick fundraising page. and lots of funds for Invest in ME - Happy Halloween everyone!